Ofcom has received an application from MuxCo Wales seeking permission to allow it to extend the formal licensed area for its local DAB digital radio service in Mid & West Wales to include areas such as Swansea. 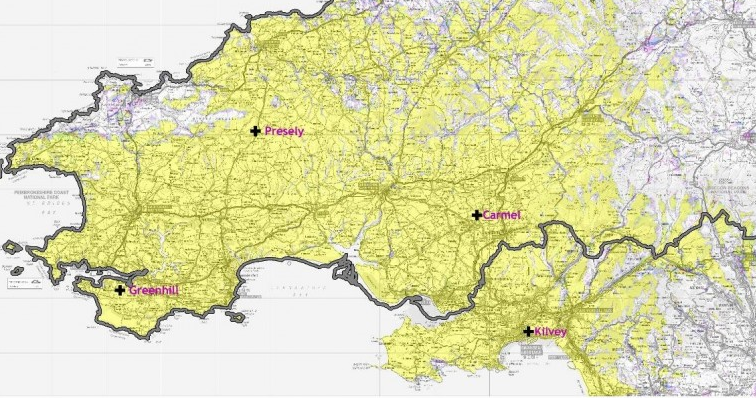 MuxCo is responsible for operating the local DAB multiplex, which launched in 2013 and officially serves the counties of Pembrokeshire, Carmarthenshire, Ceredigion and part of Powys. Due to local terrain, the licensed area varies to the actual coverage area, but thanks to its transmitter on Kilvey Hill, overlooking Swansea, its stations can already be heard in the city and surrounding areas, although technically these areas haven't been part of the multiplex's licensed area. The Mid and West Wales DAB multiplex already covers Swansea thanks to its transmitter at Kilvey Hill, overlooking the city. 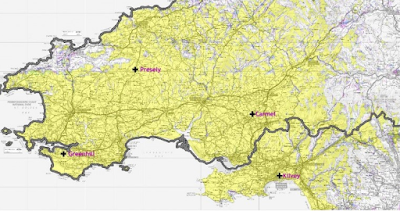 With the application, MuxCo wants to formalise its coverage of Swansea in its licensed area - effectively moving the line shown on the map above to include the highlighted area around Swansea. MuxCo says that the line-up of stations available locally on DAB would not be affected by the proposed change. Swansea also has another local DAB multiplex covering the area, increasing the amount of capacity for local stations on DAB in the city. According to MuxCo's application, the changes, if granted by Ofcom would formally increase the number of adults served by the multiplex from 135,078 (62.9% of the adult population) to 245,144 (75.1%). The number of roads covered by the multiplex would increase from 711 km (53.8%) to 894 km (62.3%). These are purely administrative changes, as MuxCo's signal already unofficially overlaps into these areas. Ofcom is consulting on these changes and will announce its decision in due course. MuxCo is currently looking at adding an extra transmitter in Fishguard to help boost coverage in the multiplex's original licensed area.